Conclusion of the Creation trilogy by Möller/Krantz. A modern fairytale about three pregnant thieves who end up in the hands of ancient forces with apocalyptic motives on their way to the cursed town of Daruunuu. A collaboration between filmmaker Henrik Möller and comics artist Lars Krantz to create a fairy tale with the cosmic awe of H.P. Lovecrafts Dreamlands & Hope Hodgesons Nightland. Inspired by the short story “The man who created god” by Richard Stanley. Story, art and design by Allan Haverholm. 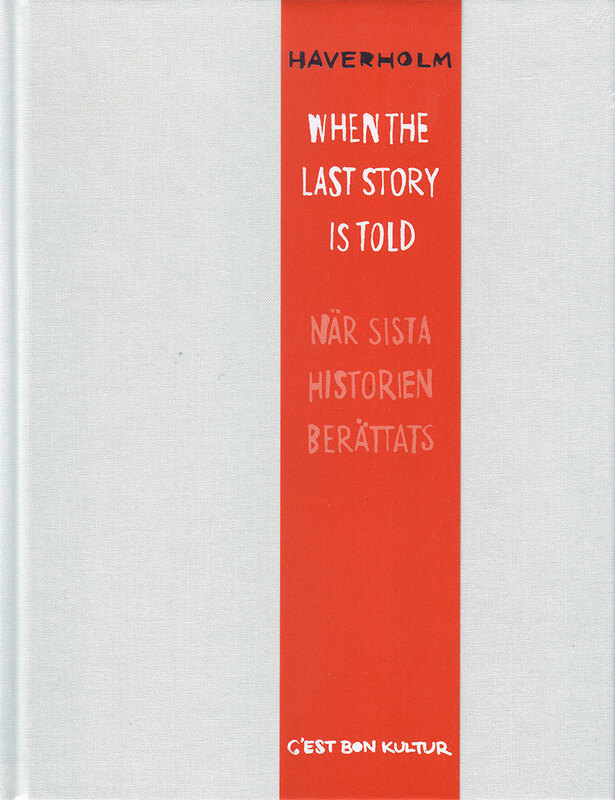 “When the last story is told, its absence rings with colour: Shapes & structure linger”– Like the clap of thunder when the air rushes to fill the vacuum from a supersonic plane, Allan Haverholm poses the question: When the last story is told, what fills the space it leaves? In the latest book by visual artist Allan Haverholm, narrative gives way to another order of meaning. Although the pages are divided into comic book grids there is nothing to constitute a traditional story, or even pictures in a sense that one would expect. The only text in the book, quoted above, frames the 60 pages of minimalist colour compositions alternatingly obscured with bold strokes of white paint and abstract, black textures. The book questions one of the basic elements of our culture: storytelling and its underlying structures. Its very title suggests a potential end of narrative, but also that something else may fill the gap, a still-fluid substance or undefined fictional construct forming after this universal aphasia. Like a message from an alien mind, When the last story is told is loaded with meaning encoded in an undecipherable language. 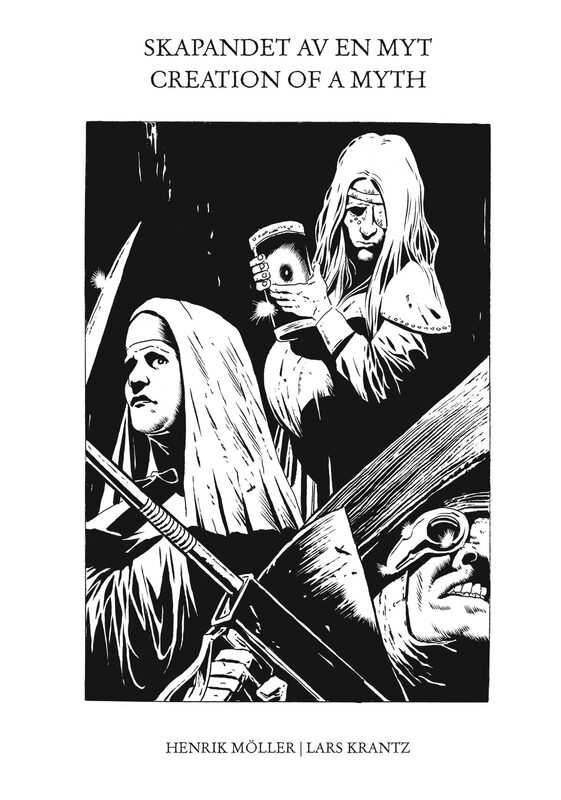 Since his 2006 book debut (the 300 pages Sortmund, hailed as Denmark’s first graphic novel), Allan Haverholm has stubbornly explored the comics medium for new approaches to the art form, changing effortlessly between a wide range of expressions to fit each new project. Persistent themes in his work include language and music, and their application in comics form. When the last story is told is Haverholm’s eighth book as a single author; he has illustrated some fifty books, published several collaborations with likeminded artists, and appeared in more anthologies than he cares to think of or even count. His art has been exhibited internationally. 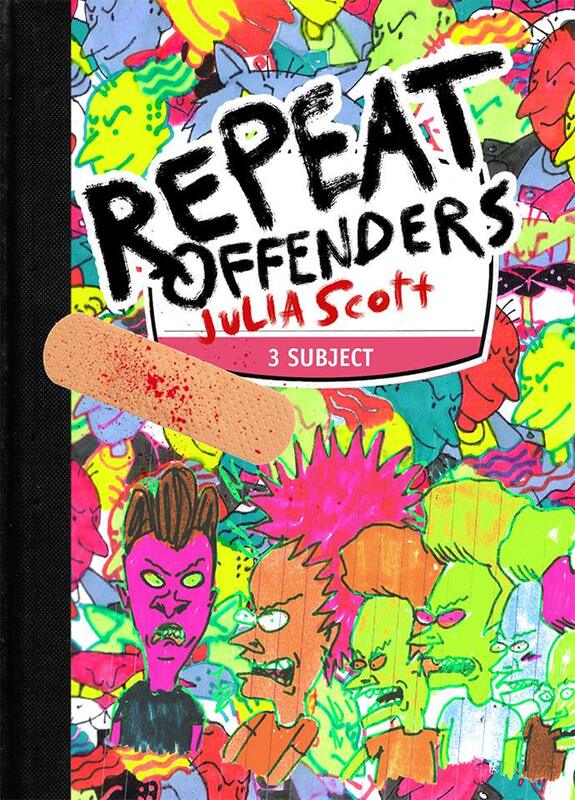 CBA vol 33: Repeat Offenders is Julia Scott’s solo debut about growing up weird, growing up other, and taking courage from the seemingly innocuous cartoon villains that populated the childhood of a generation. Find me in this city is a story about isolation, finding your self and learning to be alone. The book mixes fiction and autobiographic elements. The end result is a fictive story of a girl who has lost her face in a strange city. While she is looking for herself, the cat is looking for the scary yet intriguing dark character who the dog is calling Nightmare. But can you trust a dog who is always lying? 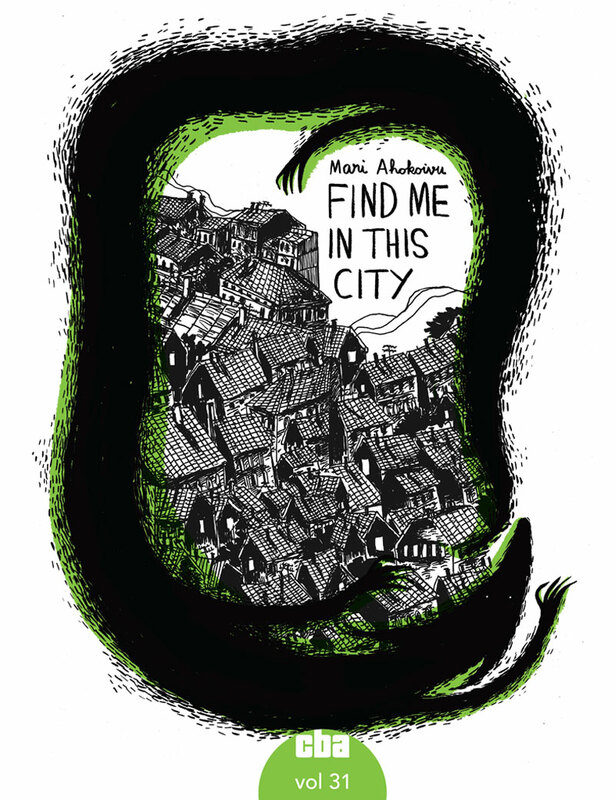 Find me in this city was first published 2009 in Finnish by Asema Kustannus. It was Mari Ahokoivu’s first graphic novel, although not her first published comic book. Other publications by Mari Ahokoivu includes Sarjakuvantekijän opas (BTJ kustannus 2007), Lola Olifante (Éditions Cambourakis 2014-2015) and Sanni och Jonas (Rabén & Sjögren 2015). Mari Ahokoivu (b.1984) is a Finnish comic artist and illustrator who draws comics for adults and for kids and has been published in Finland as well as abroad. She has studied comics in Finland, France and Sweden and now sometimes teaches comics herself. Ahokoivu enjoys watching movies and playing roller derby. At the moment she lives in northern Finland. What We Knew is a collection of wordless surrealist poetry in the form of a graphic novel. The novel aims to be a selfish and intimate experience for both artist and reader, where the reader can find their own meaning and interpretation instead of taking on the artist’s. The stories in the novel take place in a silent world filled with subtle momentary expressions, where the world itself is as loaded with emotion and as much a part of the storytelling as the characters. The outer reality becomes the inner emotional world and static things take on a movement that can’t be controlled or avoided. An airbrush-painted story about loss and psycho-geography; how our environment affects us psychologically. The story follows a young woman, who in dealing with the death of her lover, finds that the traumatic memory of her loss is tied to a collapsed archive. Later, she realizes that not only the archive, but other places in different ways similar to it, triggers the same painful recollections. Now at her wits end, she makes a discovery. The dustcover also folds out to become a blueprint. The first graphic novel from Mexican comics artist Inés Estrada. A psychedelic science-fiction epic trip across different planes of reality. Lapsos follows the adventures of two friends who discover the existence of various dimensions between their home city in Mexico, and the gradual realisation that everything is connected, it’s marked with Estrada’s signature gross-but-touching humour and vivid characterisation. Dutch artist Marcel Ruijters’ funny and unusual All Saints is a collection of short stories featuring female saints and their lives, depicted in a style inspired by illuminated manuscripts and told with a wry sense of humour. Marcel Ruijters is well known in his home country, and is published in several other European languages. Story, art and design by Niklas Asker. Piracy is Liberation is Mattias Elftorp’s epic cyberpunk postapocalypse story. Books 001-006 were published by CBK, and then 007-011 moved to Wormgod where all of them were collected into two massive volumes. The Free Section is being evicted and violence erupts, on both societal and individual levels. Information_copy has been captured by the Infopolice, but can their interrogator break her? The keepers of the violence monopoly do their best as usual to enforce order and control and they are stronger, have better weapons. So who will win in the end? Can there even be a winner?This book wraps up the first volume of the PIRACY IS LIBERATION series. Story, art and design by Mattias Elftorp. The Class 4 Drivers go on strike, but taking on the Work Control police force is dangerous. Someone could die! This book also contains the follow-up on the events in book 001: Information Wants to be Free. What consequences are there to being a copy of oneself? Piracy is Liberation 002: Infotrip 2nd ed. Set a year after Information Wants to be Free, we follow Pirate and Information as they rejoin the fight for freedom in the City that’s become synonymous with the world to its inhabitants. Back in the free and illegal flow of information after a year without it, Pirate and Information are almost overwhelmed, but that’s ok. It’s part of the high. Technograph visits the old people in the desert outside the city, and a whale passes through the City’s airspace. Pirate is an information addict. When he recieves a cry for help: ‘Information wants to be free’, he has to find out what it means. Only problem is that the infopolice are hot on his trail, so he has to run and avoid falling in the same trap that Information did. Piracy is Liberation: Infotrip 1st ed. Set a year after Information Wants to be Free, we follow Pirate and Information as they rejoin the fight for freedom in the City that’s become synonymous with the world to its inhabitants. Back in the free and illegal flow of information after a year without it, Pirate and Information are almost overwhelmed, but that’s ok. It’s part of the high. Technograph visits the old people in the desert outside the city, and a whale passes through the City’s airspace. This all leads up to an event of great importance for the resistance. It is the beginning of something new. A seed for the future.